Motorcyclists are 28 times more likely to suffer a wrongful death in an auto accident than passenger car occupants. In 2015, motorcyclists represented 14 percent of the total traffic fatalities, 17 percent of all occupant fatalities, and 4 percent of all occupants injured. However, motorcycles only made up 3 percent of all registered vehicles in the United States and accounted for only 0.6 percent of all vehicle miles traveled. These statistics are from the NHTSA's National Center of Statistics and Analysis. However, a person only needs to speak with an experienced motorcycle rider to understand the risks faced by a motorcycle involved in an auto accident. If you wish to discuss your claim with an Atlanta lawyer handling motorcycle accidents involving automobiles and trucks without any charge or obligation, click here. Unfortunately, motorcycle accidents regularly occur because automobile drivers do not always maintain a lookout for motorcycles. This is despite the many safety precautions taken by motorcyclists when driving. As the above statistics indicate, in an accident between a motorcycle and automobile, the motorcycle generally loses the battle. Unfortunately, these types of collisions are all too common on our roads and interstates today. The investigation of these accidents is made more complicated by the inherent bias that often exists with members of law enforcement and the public against motorcycles. The severe, debilitating and permanent injuries that arise when a motorcycle is in an accident with automobiles and trucks result in significant financial losses to the individuals involved and their families. However, the law provides an injured person with the right to recover his or her damages from the responsible party. Such damages include, but may not be limited to, medical expenses, lost wages, funeral expenses and other economic losses. Individuals are also entitled to recover for the pain and suffering caused by their injuries and treatment. The spouse of the injured person is entitled to recover for the loss of the services of his or her spouse. Although a monetary recovery can never repair the damage that is done to the individual, it can at least ease the financial burdens created by the car accident. The insurance company for the automobile or truck will start an investigation of the motorcycle accident immediately. The insurance company will try to limit the recovery of the injured motorcycle rider to the lowest possible amount. Accordingly, these companies have established very specific and elaborate procedures on handling motorcycle accident claims, especially in the early stages of the claim. Immediately after a motorcycle accident, the insurance company will take recorded statements from the persons involved in the motorcycle accident, have the motorcycle and auto examined, have photographs taken, obtain the police report and try to establish the extent of the injuries suffered in the motorcycle accident. The insurance company is usually able to accomplish all of these items within the first week after the motorcycle accident and many of them within the first 24 hours after an accident between a motorcycle and an auto or truck. If you wish to discuss your claim with an Atlanta lawyer handling motorcycle accidents involving automobiles and trucks without any charge or obligation, click here. 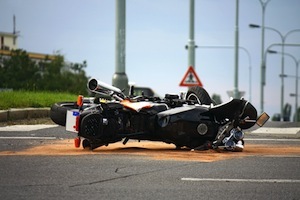 The approach or tactics of insurance companies vary; however, many insurance companies try to reach a quick settlement with an injured motorcycle rider. Their purpose is to avoid responsibility for future medical expenses, lost wages and other damages that are likely to develop. This is a trap that an injured motorcycle rider needs to avoid. When a person is injured in a motorcycle accident, it very often takes months to completely assess the person's injuries. At that point, the person may need surgery or other extensive treatment. The injuries may leave the person permanently disabled even after corrective surgery. Therefore, the true value of a claim from a motorcycle accident can only be assessed after a physician has established a firm prognosis. The State of Georgia provides in most, but not all cases, a two-year period of time in which to file a lawsuit on a personal injury claim. Accordingly, there is no need to rush to a settlement with the insurance company for the auto or truck. You will only regret the settlement later when your injuries have become progressively worse. There are other significant issues that develop for persons injured in a motorcycle accident with a car or truck. For instance, if your health insurance company pays for your medical bills they will very often seek reimbursement from your settlement with the insurance company or company for the auto or truck. There are significant limitations on their right to obtain such reimbursement. Likewise, if you were on the job when injured, the worker's compensation insurance company will try to obtain reimbursement of their payments for medical expenses and lost wages. Again, there are significant limitations on their right to receive reimbursement. These are important issues that you need to understand prior to agreeing to any settlement with the insurance company for the auto or truck. If you wish to discuss your claim with an Atlanta lawyer handling motorcycle accidents involving automobiles and trucks without any charge or obligation, click here. In the State of Georgia, individuals are required to maintain liability insurance coverage for auto accidents. The minimum requirements for bodily injury liability insurance coverage in Georgia are $25,000.00 per person and $50,000.00 per accident. Since these insurance limits may be insufficient to cover the claim of an injured person, very often the injured person must explore what other insurance is available to the responsible driver or the extent of the driver's personal assets. The responsible driver may have the right to coverage from insurance policies of family members, an employer, a rental car company or from an "umbrella" policy. In addition, other unknown persons or entities may also have liability for the collision. For instance, if the road or a light was defective, a government agency may share responsibility for the collision. Further, your own insurance policy may provide you with additional coverage for your injuries from a motorcycle accident. Determining the appropriate value of a claim for personal injury from a motorcycle accident involving an auto or truck is complicated. It involves evaluating the nature and extent of the injury, the economic losses that are recoverable, and the liability issues related to the motorcycle accident. The location where a trial would take place and any prior injuries suffered by the claimant are issues that are also factored into any evaluation of a personal injury claim. Insurance companies for automobiles and trucks have vast experience in evaluating personal injury claims from motorcycle accidents and will seek to obtain the lowest settlement possible. Therefore, it is important to have an attorney or lawyer with considerable experience dealing with the insurance company on your behalf. Generally, it is best to retain an Atlanta motorcycle accident lawyer or attorney who regularly handles personal injury claims involving motorcycles. Your attorney or lawyer must be prepared to institute litigation on your behalf if the insurance company is unwilling to settle your claim for a fair value. If you wish to discuss your claim with an Atlanta lawyer handling motorcycle accidents involving automobiles and trucks without any charge or obligation, click here.